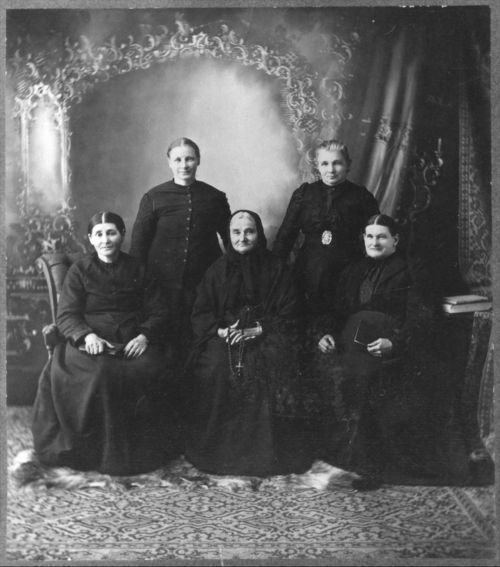 This black and white photograph shows a group of Volga German woman from Ellis, Kansas. The women are dressed in traditional Volga German clothing of dark, simple dresses. They have been identified from the front row as follows: Agnes Schueler Karlin, Marcia Beilman Karlin, and Anna Staab Karlin. Back row: Dorothea Schuetz Karlin and Anna Meier Karlin. Many Volga Germans were lured to Kansas by advertising campaigns that promoted productive farmland and exemption from military service on religious grounds. These incentives encouraged many Volga Germans to migrate to the Ellis, Rush and Russell counties in Kansas to buy the lands owned by the railroad companies. In those close knit and sometimes isolated communities, German customs and strong religious beliefs were maintained for several decades.